Daily Acts of Resistance: Do You Live in One of These States (Or Know Someone Who Does)? Do You Live in One of These States (Or Know Someone Who Does)? 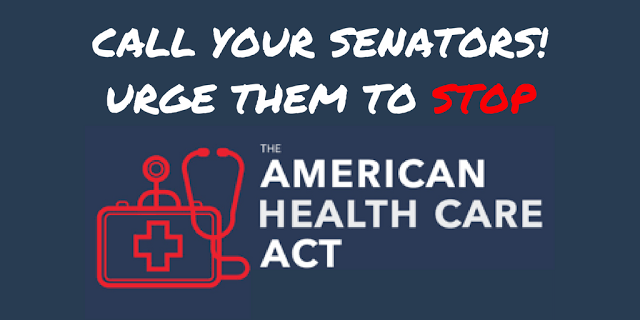 We need to convince at least three Republican Senators to stop the bad healthcare bill from passing in the Senate and protect the Affordable Care Act (ACA). Apparently, they will cast their votes sometime in the next three weeks despite not holding hearings on the bill or releasing it to the public - it's all very hush-hush. If you live in one of the states below, it is essential that you call both your Senators today and, ideally, every day until they vote on Trumpcare which could be anytime before 6/27. If you don't live in one of those states but have friends or family who do and support the ACA, please forward this email to them now and ask them to call. 1. Call 844-432-0883 (MoveOn's number) and follow the prompts. 2. Once you get through, here's what you can say - feel free to improvise: "Hi, my name is _______ and I'm calling from ______. I'm calling today to urge the Senator to protect my health and the health of other people in our state by voting NO on the American Health Care Act (aka Trumpcare)." Feel free to add your own experience with the ACA if you have anything to share. Always be polite and don't forget to thank the person who takes down your information. Here are some more talking points you can mention if you like. 3. Post on your Senators' Facebook pages and Tweet at them about the healthcare bill urging them to reject it and protect the ACA. 4. Forward this email to anyone you know in these states.